This donation was a result of matching funds from the Peterson Donation Drive we announced in November 2017. More than $11 000 was donated to the Richmond Food Bank in the Peterson Donation Drive, plus 200 lbs of nonperishable food was collected. The generous donation that Peterson made and the support they inspired will help the more than 2200 people we serve each week. The donations we received will help us purchase milk, fresh fruits and vegetables, and breakfast and lunch items for our school meals program. We rely on the support of local businesses, faith communities, schools, and people as we receive no financial support from any level of government. This is the second year in a row that Peterson has held a matching donation drive. Last year’s drive raised more than $6500 (plus Peterson’s matching donation). It’s amazing to see the growth in just one year! 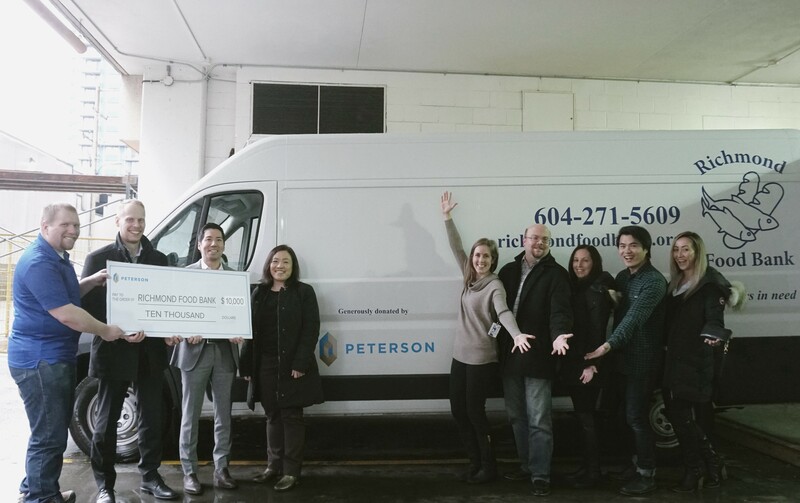 Thank you, Peterson Group, for your leadership in rallying the community to help our neighbours in need. We are very grateful for your generous, thoughtful, continued support.